Composting. For some gardeners, it’s a mystery, a practice that would magically improve their soil if only they knew how to get started. To other gardeners, “composting” conjures images of backbreaking labor or unpleasant smells. Triangle residents can banish those fears by visiting several publicly accessible compost demonstration sites. The Compost Learning Lab at NC State University is unique in that there’s no compost in it. 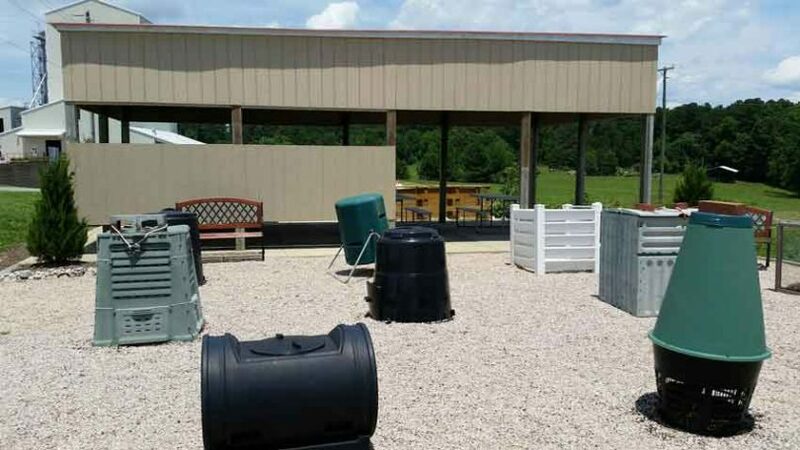 This collection of 13 outdoor bins showcases the variety of models available for backyard composting. Site founder Rhonda Sherman deliberately left the bins empty so that visitors can visualize how they might look in their own landscapes. Seeing the bins empty also allows visitors to think about how compostable materials might go in or out. Hint: if you can’t figure out how it works, maybe it’s not the right bin for you. The Compost Learning Lab also includes two spaces for teaching: a covered pavilion and a small building. The nondescript building is actually a worm barn, sheltering several thousand red wiggler worms, tenderly looked after by a “worm concierge” from the university. Wake County Master Gardener volunteers assist Sherman in hosting occasional workshops on backyard composting and vermicomposting. Twelve miles northwest of the NC State Compost Learning Lab, Cary’s Bond Park offers a rich experience for aspiring composters. The Compost Education Center is nestled within a garden that also includes native plants and plants that benefit wildlife. Weatherproof kiosks explain the composting process in clear, simple language. Meander through the garden to find both homemade and commercially available bins. A large wooden box nestled in the ground shows how vermicomposting can be done outdoors, a nice contrast to the Compost Learning Lab’s worm barn. Curious visitors can easily lift the lids to peek at the leaves and twigs breaking down inside. A simple bulletin board above the bins illustrates the composting process. A small number of brochures are available to take home. Unlike Cary’s parks, the composting display at Orange County Solid Waste Management is a little off the beaten path. At the same time, its visibility shows that composting, when managed correctly, can happen almost anywhere. A tall box sits in the grass near the solid waste headquarters building. Adjacent to it, a large sign uses colorful graphics to explain the composting process. The entire setup is close enough to the building that one can imagine employees coming at on their lunch breaks to drop in an apple core. The three-compartment bin provides ample space, allowing older materials room to rot without being mixed with fresh debris. The custom-made bin is clearly larger than the commercial bins sold by the department, allowing for conversations about the benefits and drawbacks of making a bin. Composting guru Muriel Williman teaches free composting classes at the site, along with a demonstration site at the Community Center Learning Garden behind the rose garden on Estes Drive in Chapel Hill. Environmental Services / Solid Waste.